I was recently interviewed by Josh Daniels of the Libertas Institute in Utah. We discussed my career, my views on the importance of prosecutors acting ethically as ministers of justice, and my thoughts on the death penalty. I explain in Chapter 1 of my book how I was nudged by one of my law professors, Paul Boland, to take a trial advocacy course when I was at UCLA, and how that experience and Paul’s encouragement changed the entire course of my career. Three generations of our family have had similar experiences — people entering our lives at key points and making a tremendous difference by offering support and encouragement. Besides my own experience, I discussed stories relating to my father, my brother, and my great uncle. On April 21, 2016, I was interviewed by Marc Courtenay on his radio program, “Finding Happiness and Good Health in Today’s World,” on the Boss Radio Network. During the 30-minute interview, Marc asked me questions about my career and my book. Here’s the link to the program, which is entitled “Reluctant Prosecutor — Being True to Yourself.” You’ll need to scroll down to find the program title. Here is my op-ed piece in the Salt Lake Tribune on March 8, 2016, expressing my view that the death penalty should be abolished. The article is a condensed version of a much more thorough analysis in Chapter 22, “Handling Capital Cases, and Thoughts on the Death Penalty.” And no, I didn’t come up with the title – not really my style. NOTE: The website for “Public Safety Officials on the Death Penalty” (PSODP) has now posted Chapter 22 in its entirety — the chapter in which I discusses my experience handling capital cases and my views on capital punishment. It is a much more thorough treatment of the issue than what was contained in the short op-ed piece I wrote for the Salt Lake Tribune last month. Look at the section of PSODP’s website that says “Why We’re Concerned” to find the link to my chapter. Here is my interview on a Utah radio talk show on February 27, 2016, during which I discussed the death penalty and why, after having prosecuted a dozen capital cases, I think we would be better off as a society without it, as I discuss in greater depth in Chapter 22 of the book. Here is an article that appeared in the Huffington Post on March 11, 2016. It discusses the attempt in the Utah Legislature to abolish the death penalty this year. “The Case of Arthur Bishop” aired on November 1, 2012. Co-counsel Bob Stott and I were featured in the episode, which detailed Bishop’s kidnapping, sexual assault and murder of 5 young boys over a 4-year period. The program also discussed the investigation and the trial which resulted in Bishop’s conviction and death sentence. 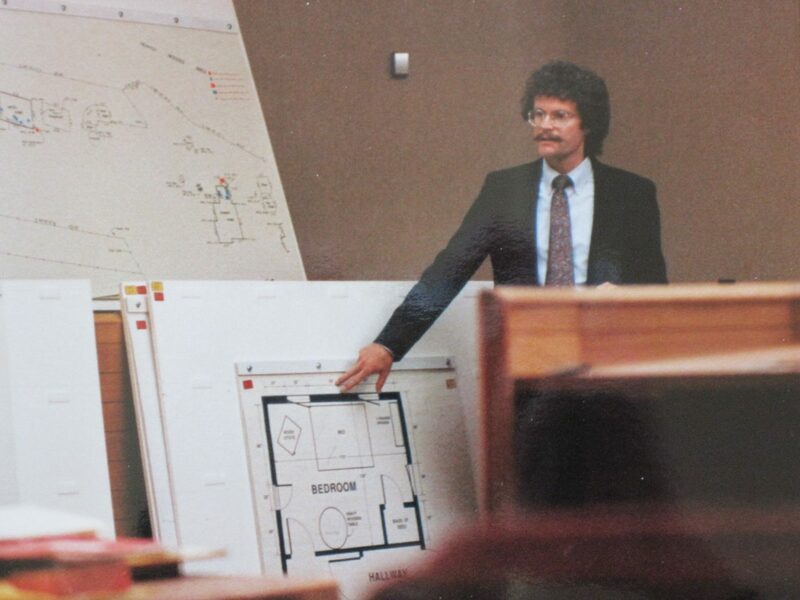 The case was solved by Detective Don Bell of the Salt Lake Police Department, whose skillful interrogation led to Bishop’s confession and the recovery of the victim’s remains. Don was also featured in the program. The Bishop case was one of the most disturbing of my career. This 1992 made-for-TV movie dramatized the Singer-Swapp case, in which a group of polygamist extremists in 1988 bombed a Mormon Church building and then engaged in a thirteen-day standoff with state and federal law enforcement officers, culminating in a shootout and the death of Fred House, a Utah State Correctional Officer. David Schwendiman and I prosecuted the case in both state and federal court, as highlighted in Chapters 10 and 11 of my book.